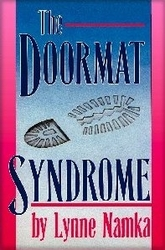 If you have ever given to the point of exhaustion, felt dumped on or ripped off, and puzzled to find yourself coming back for more; if you are involved with people who don’t appreciate you, if you equate love with doing for others, you may be experiencing The Doormat Syndrome. Are you…..a people pleaser? addicted to dysfunctional love relationships? preoccupied with meeting the needs of others? hooked into feeling good by pleasing someone else? blame yourself when things go wrong? feel your self sacrifices are not appreciated? have trouble accepting love? There is no fix like the fix of trying to fix someone who is perceived to be broken! That is the heavy part. Now for the lightness, cheer and happiness part. What has been learned can be unlearned!